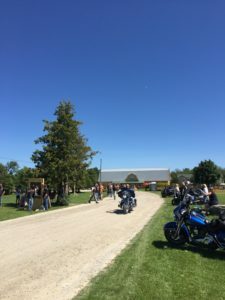 Our First Annual Tay River Rally hosted by the Eyes of Odin Military motorcycle Riding club took place at our farm in Perth July 29 to 30. We had over 70 bikes show up from all over. Not bad for Year One on a busy summer weekend when lots of other motorcycle events were going on! Thanks to Captain Wayne Leblanc and the Eyes of Odin riders who came from Trenton, Petawawa and as far as Fredericton (15 hours!) for the rally. 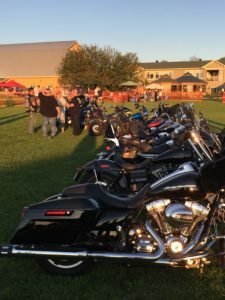 The motorcycle games were organized by the Celtic Brotherhood, who ride in support of PTSD and traumatic brain injuries. We also were pleased to welcome some J.E.R.K.S, some members of the Veteran Commandos and some from UN NATO. BBQ Pork and Lamb were provided by Robert Carpenter, the Beckwith Butcher from Carleton Place. The smoked pork he prepared in his Traegers was totally delicious! These run on wood pellets so you never burn the meat. Great option when there’s so many distractions all around and you’ve got large numbers to feed. The live music was outstanding. A big Thank you to Dan Schwetz and his band “The Last Supper”. 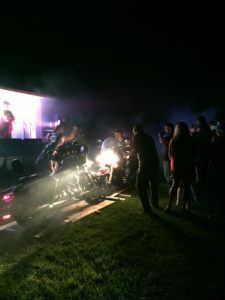 Their lively original rock and roll songs could almost drown out the duelling bikes in the burnout pit. I’m sure that everyone thought it was worth the ride just to hear this band. 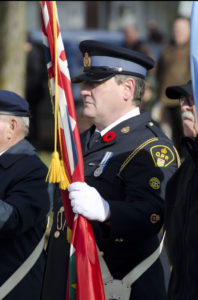 They are from the Smiths Falls area but play to huge audiences all over the world. We had so many of the graduates from our cohorts come “home” to help. So great to see everyone again. It was such fun to watch the members of different cohorts meet and mingle. They have so much in common. I’m sure they felt like they were hanging out with family they just hadn’t met yet. A joyful reunion for sure. Can’t wait for next year! It seems like we pulled this rally off in a few short weeks. Pretty amazing considering none of the Eyes of Oden riders had seen the farm to recce beforehand. Should be even more spectacular with a year to dream and scheme.